LAKESIDE (NEWS 8/CNS) - A road-rage incident ended with a fiery crash in Lakeside, sparking a blaze that destroyed a business and adjacent home, and deputies responding to the incident pursued a car full of people into El Cajon where a man barricaded himself in a pharmacy and stabbed himself in the neck when deputies barged in, officials said Sunday. The initial confrontation began shortly before 7 p.m. Saturday between two vehicles on State Route 67, San Diego County Sheriff's Sgt. Dustin Lopez said. One of the drivers, a Lakeside resident, exited the highway in an attempt to seek help at the Lakeside sheriff's substation. At Vine Street and Parkside Street in Lakeside, about two blocks from the substation, the female driver of the other vehicle attempted to speed around and cut off the Lakeside man seeking law enforcement help, Lopez said. 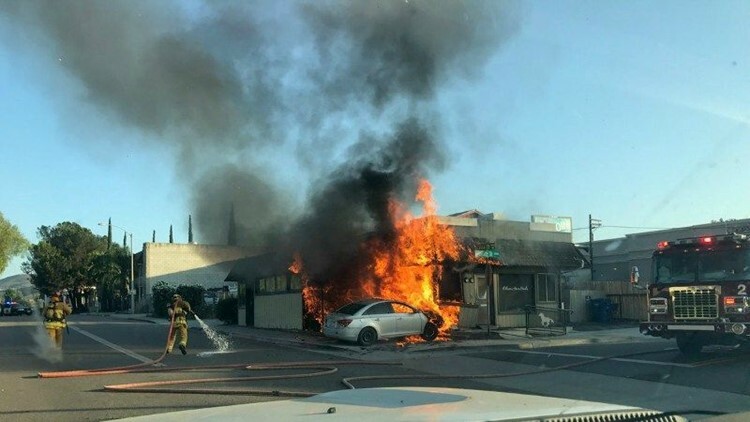 But the driver lost control and crashed into Solis Hair Studio at 12585 Parkside St., and the vehicle caught fire, igniting a blaze inside the salon that badly damaged the building before crews from Lakeside Fire Department brought the fire under control. Richard Rodriguez's home was also damaged by smoke twice in two days as fire crews put out flames at the adjoining hair salon that smoldered overnight. "I was asleep and I heard a loud screech and the bang that came after it. Obviously the car was in the side of the building, oil started dropping and the flames hit next and that was it from there," Rodriguez said. "I ran back inside and grabbed my jacket, my shoes and that was all because it started going up." After the crash two people fled on foot. "The occupants of the vehicle, a female driver and male passenger, ran from the vehicle and fled northbound on Vine Street near the Lakeside Library,'' Lopez said. The driver was described as white with blonde hair wearing a blue shirt, and her passenger was described as a white man with his hair in a ponytail, with several tattoos on his arms and wearing a hat. "It made me upset because she was laughing as she was running away," said Rodriguez. Deputies rushed to the scene to help. A deputy responding to the crash spotted a white sedan speeding away from the scene with four occupants, including a man who appeared to match the description of the passenger who fled, Lopez said. The deputy attempted to stop the white sedan, but it sped away and deputies gave chase, though it was later determined the sedan was not involved in the road-rage incident or the crash. As deputies pursued the car, one occupant jumped from the moving vehicle on Channel Road in Lakeside, sustaining head and shoulder injuries that required he be taken to Sharp Memorial Hospital for treatment, Lopez said. The pursuit continued into El Cajon where the other three occupants fled on foot when the driver stopped the white sedan on Coogan Way. One of the three, 35-year-old Chula Vista resident Ruben Chavez, was immediately arrested and later booked into the San Diego Central Jail on drug and weapon charges, the sheriff's sergeant said. Another occupant escaped, while deputies chased the third into the CVS Pharmacy at 572 Fletcher Parkway, across the street from the Parkway Plaza mall. Lopez said. Talavera attempted to run out a back door, but when it was locked, he used chairs to barricade himself inside the pharmacy's break room. When deputies forced their way into that room, Talavera stabbed himself in the neck several times. A deputy deployed his Taser on Talavera, causing him to drop the knife and allowing deputies to safely approach and detain him, Lopez said. He was hospitalized serious injuries and will face multiple charges including possession of meth. Surprisingly, none of the people involved in that pursuit are suspected of driving the car that destroyed the salon and Rodriguez's home. Authorities are still searching for the woman who drove that car. "It was super quick," he said. "Something you don't expect too happen, but all you can do is pray about your next move. I'm sure God will bless us." An online fundraiser has been established to help Rodriguez and the rest of the family displaced by the fire. Sheriff's officials ask anyone with information about the road-rage incident or the pursuit to call Crime Stoppers at (888) 580-8477.